Dyslexia is not covered under the law. Assume your best Ms. Manners / Columbo demeanor while you ask the school to help you understand the definition of specific learning disability in IDEA 2004. (A) In General. 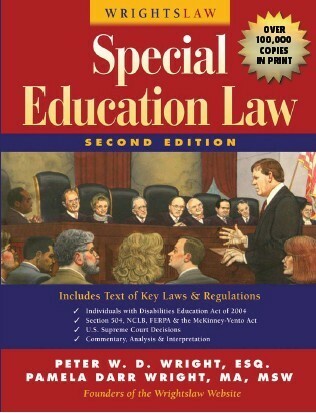 The term ‘specific learning disability’ means a disorder in 1 or more of the basic psychological processes involved in understanding or in using language, spoken or written, which disorder may manifest itself in the imperfect ability to listen, think, speak, read, write, spell or do mathematical calculations. (B) Disorders Included. Such term includes such conditions as perceptual disabilities, brain injury, minimal brain dysfunction, dyslexia, and developmental aphasia. You will find this definition on page 55 in your Law book. Dyslexia is a language learning disability in reading, writing, spelling and/or math. From a legal perspective, dyslexia is a learning disability that adversely affects educational performance. Dyslexia is just a general term and doesn’t really mean anything, so we don’t have to provide services to kids with dyslexia. Do not argue with the school. You will not change their attitudes and beliefs. Shift the discussion and focus on using the 5 Ws + H + E questions. Ask questions to flush out their positions so that you can figure out how to change their focus. A straight up argument is not persuasive and does not change their perspective. However, their own emotional response is impacted by empathy. Market to those emotions to change their thinking and perspective. Your child is just developing slower than most children, so we don’t want to provide any help with reading until third grade. Learn about the principles of early intervention and the importance of learning how to read up to third grade. After third grade, children are reading to learn. Try to help the school team see the damage created by waiting to fail – rather than focus on intervention now. Emphasize the importance of avoiding the damaging effects of failure. When children cannot read, they fall further behind and do not catch up. Your child is doing OK, he is not that far behind. Even though you don’t see it, we believe he is making progress. Compare your child’s educational achievement test scores in reading, writing, arithmetic and spelling – on the same test, over time. If your child really is making progress, that will be evident from the test data. If not, you will know that he is not making progress, and the bar graph with show this. To determine true progress (or not) data must be objective and independent. Subjective data is not sufficient. This entry was posted in Dyslexia, IDEA 2004, Reading and tagged 5 W's + H + E, Dyslexia, IDEA 2004, Reading, Test Scores, Tests and Measurements by Pete Wright. Bookmark the permalink. My child has 2 independent evaluations spaced 5 years apart that both conclude he has dyslexia. The district says that in order for him to qualify for district dyslexia services, he must be evaluated by the district and if his test score is above the district threshold for dyslexia services, then they cannot provide him with dyslexia therapy. I have already been warned that his number appears to be just above the threshold. From my perspective this does not mean he doesn’t have dyslexia. Rather it just means that he won’t qualify for district services. My fear is that if the district responds that he doesn’t make the cut, then they will treat him as if he doesn’t have it. He does have it, just maybe a bit mild. How do I get him services through the district if he’s above their threshold?